There are so many things to do in Center City Philadelphia in winter. Philadelphia is a vibrant U.S. city lurking in the shadows of New York's glow that is often sadly overloooked by visitors on a trip to the American Northeast. I lived in and around Philadelphia for almost 8 years but left Philly nearly a decade ago to the day for the warmth, sunshine, and surprises of the San Francisco Bay Area in California. I had the chance to travel to Philadelphia in January for a friend's baby shower and took the opportunity to take a walk down memory lane and visit all of my favorite places. It's definitely worth planning a Philadelphia itinerary of 3 days or more. Read on to discover Center City Philadelphia in winter through the eyes of a nostalgic former local resident. 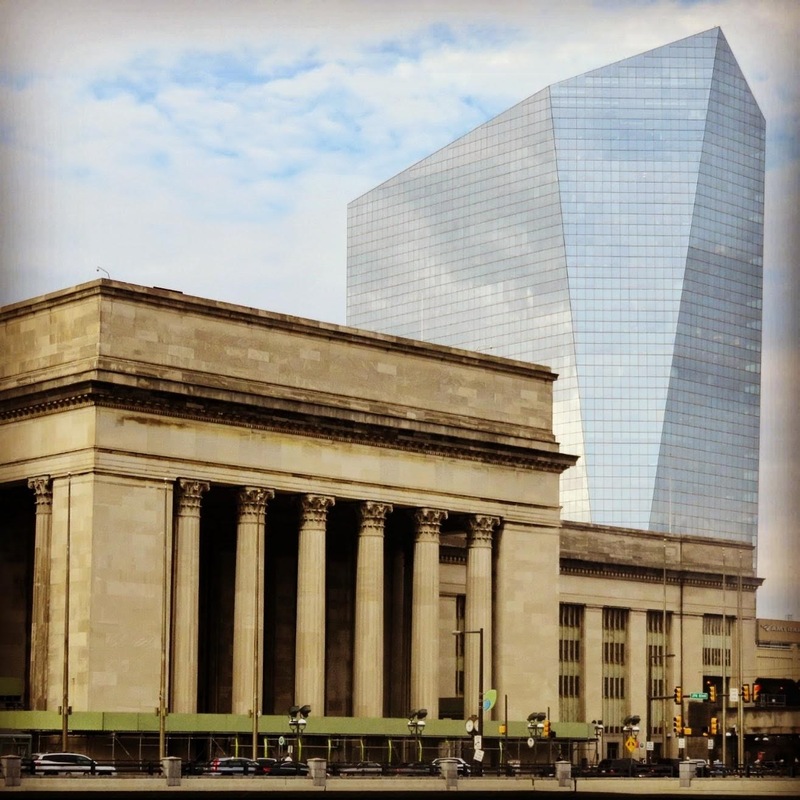 I spent about 48 hours in Philadelphia and arrived by train from Newark Airport into 30th Street Station. 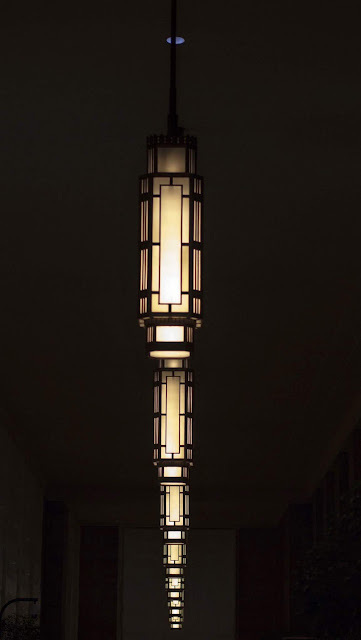 This iconic Art Deco train station is a real gem. The angular glass Amtrak Tower next door describes Philadelphia to a tee: the old and historical co-existing with the new and modern. 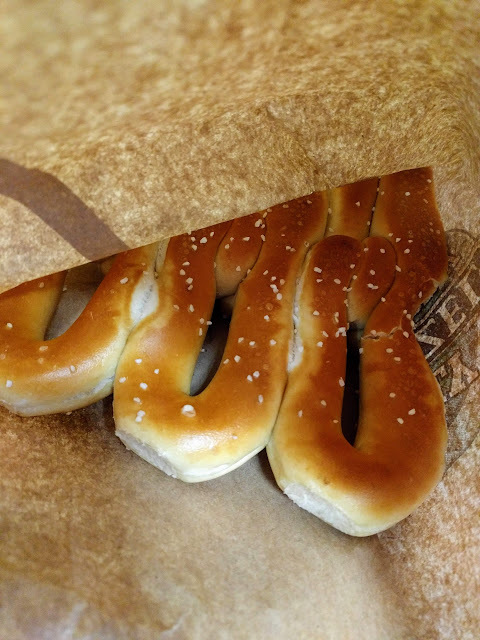 Anytime I visit Philadelphia, my first stop is always the Philly Soft Pretzel Factory. En route from 30th Street Station to my hotel on Broad Street, I made a bee-line for 1545 Sansom St. There are many locations of the Philly Soft Pretzel Factory but this is the one where the pretzels are baked and you can get a strip of 3 pretzels hot from the oven for about $2 USD. 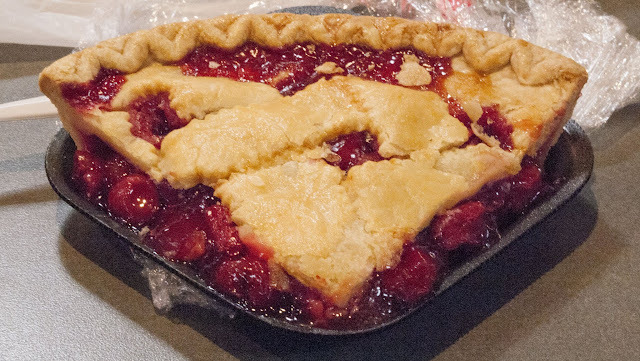 Many of my memories of Philadelphia revolve around food. After dropping off my bags, I headed toward Philadelphia's Old City and Lore's Chocolates. I used to stop for coffee here every morning on my way to the office when I worked in Center City Philadelphia. Go in, have a wander around and make up a small bag of delicious homemade chocolates to sustain you on a walk around Philly. Lore's makes Philadelphia's best chocolate. Seek it out! 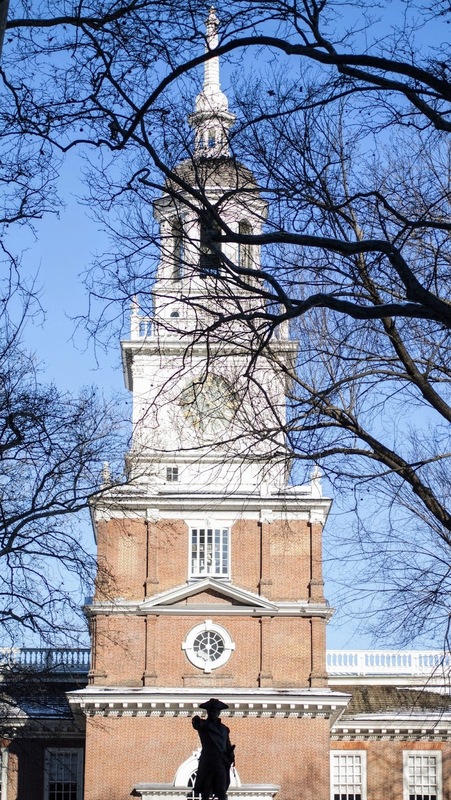 Philadelphia is where it all began in the U.S. I got a chill down my spine (nothing to do with the fact that it was January when I visited!) when I stepped onto Independence Mall; home to the Liberty Bell, Independence Hall, and the Constitution Center. Given everything going on in the U.S. right now, this plaque highlighting the First Amendment of the U.S. Constitution seems especially appropriate. Congress shall make no law respecting an establishment of religion, or prohibiting the free exercise thereof; or abridging the freedom of speech, or of the press; or the right of the people peaceably to assemble, and to petition the Government for a redress of grievances. This is what makes America great. period. Benjamin Franklin is another fascinating character whose life was intimately tied to Philadelphia. Both a scientist and a statesman, Franklin did a great deal to shape the Philly we know and love today. Look for statues of Benjamin Franklin around Center City and civic structures named after him (streets, bridges, etc.). You can even visit the Benjamin Franklin Museum in Old City. It was closing when I walked past so unfortunately, I'll have to save the museum for my next visit. Here is a view from Independence Mall that you don't often see. 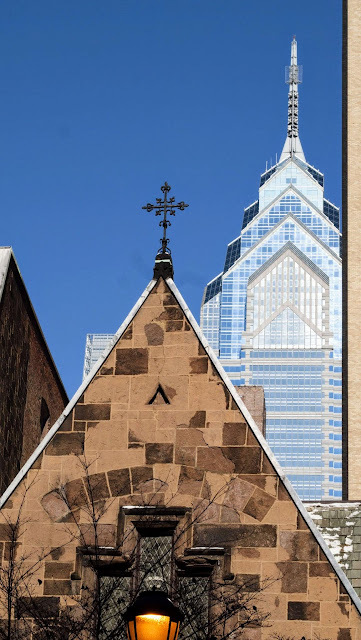 The majority of buildings surrounding this important Center City Philadelphia landmark are classic and beautiful or modern and purpose built to show off Philadephia's history (for example, the hall hosting the Liberty Bell and Constitution Center). When I worked in Philadelphia a decade ago, my office was in the 1970s concrete tower on the other side of Independence Mall. To be honest, the building itself is an eyesore but you get great views from inside. A lot has changed at the Rohm and Haas Home Office (now Dow's Philadelphia business office). There is a hipster coffee place in the lobby and a beer garden too! 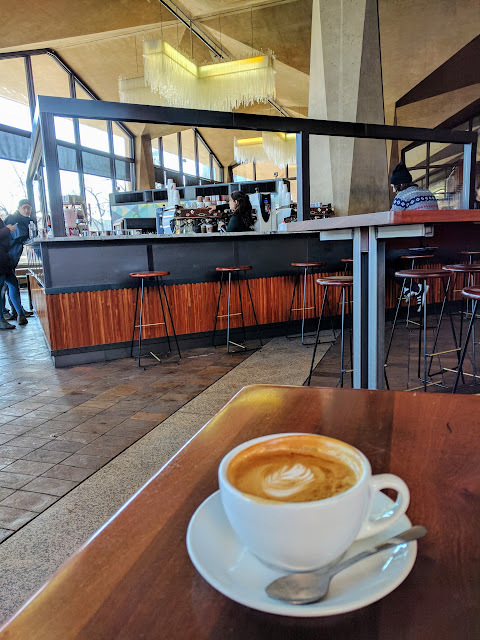 I stopped in to get out of the cold Philadelphia winter and enjoyed a cappuccino at La Colombe, Philadelphia's best local chain of coffee shops. It was surreal to me to sit there sipping a coffee underneath a Plexiglas chandelier (Rohm and Haas, my old company, invented Plexiglas). 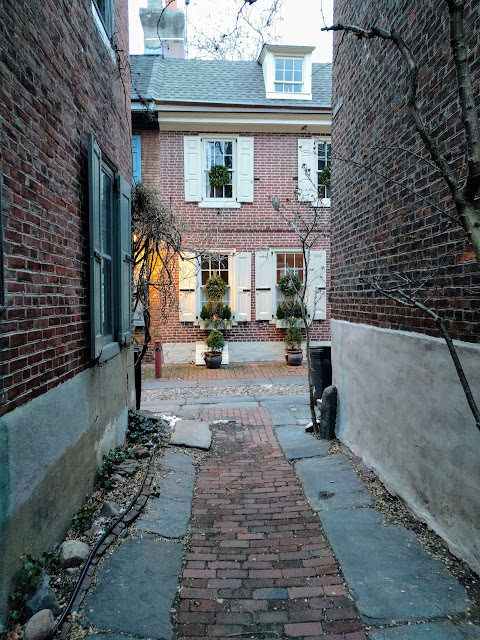 Leaving Independence Mall behind, I walked deeper into Old City and headed for Elfreth's Alley, a narrow, cobbled street featuring homes that date back to colonial times. Take a trip back in time and imagine what life in Philadelphia must have been like for George Washington, Benjamin Franklin, and our other founding fathers. 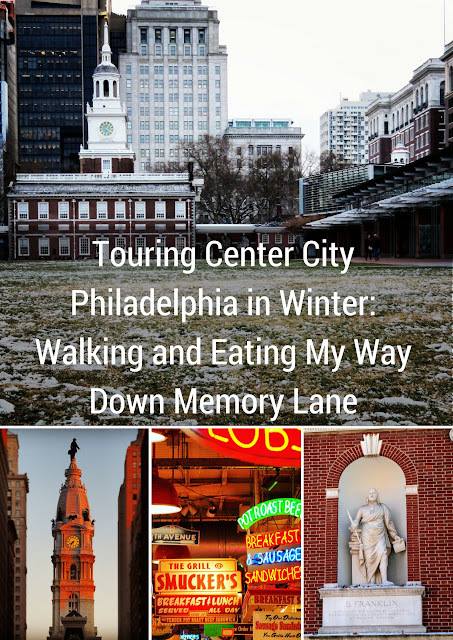 When I lived in Center City Philadelphia, Old City was the place to go if you were a foodie. That really hasn't changed. There are now just more great choices for places to eat and get a drink. 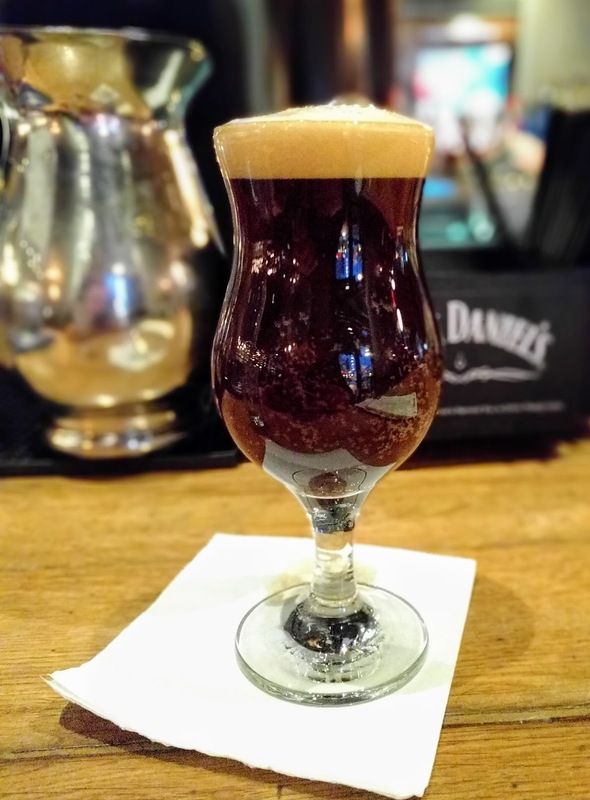 The craft beer movement has definitely landed in Philadelphia since we moved away. I enjoyed sitting in Revolution House and sampling a White Chocolate Pumpkin Porter (a spicy wintery beer) brewed just up the road by Neshaminy Creek Brewing Company. Reading Terminal Market is hands-down my favorite place in Center City Philadelphia. This world-class food hall features delicious treats (especially baked goods) prepared by the Amish (every day except Sunday). 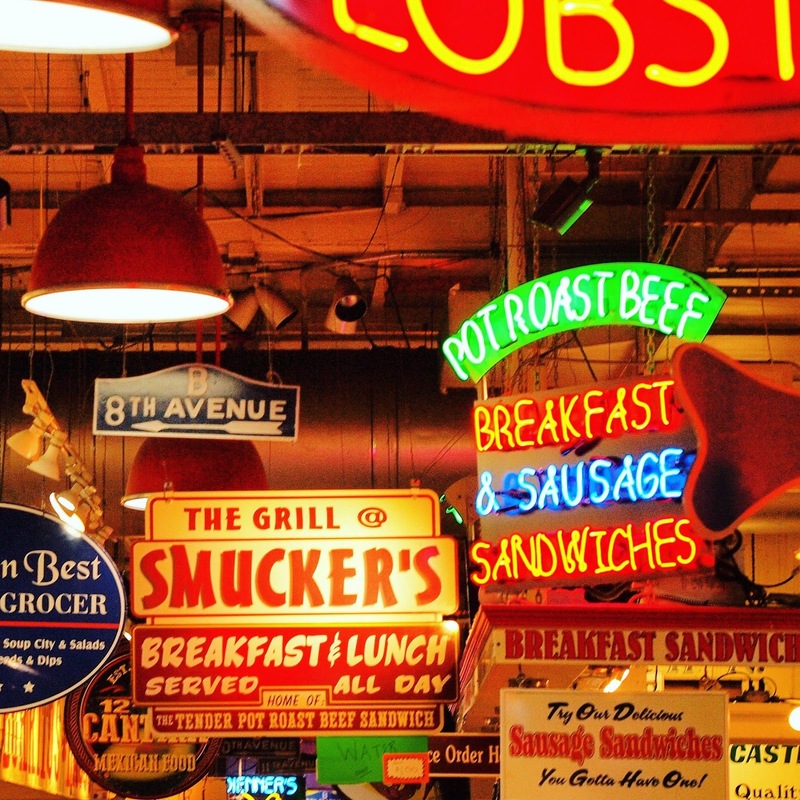 I love wandering through Reading Terminal Market and taking in the signs showcasing the amazing diversity of food on offer. Breath deep and enjoy the aromas of cuisine and spices from around the world. 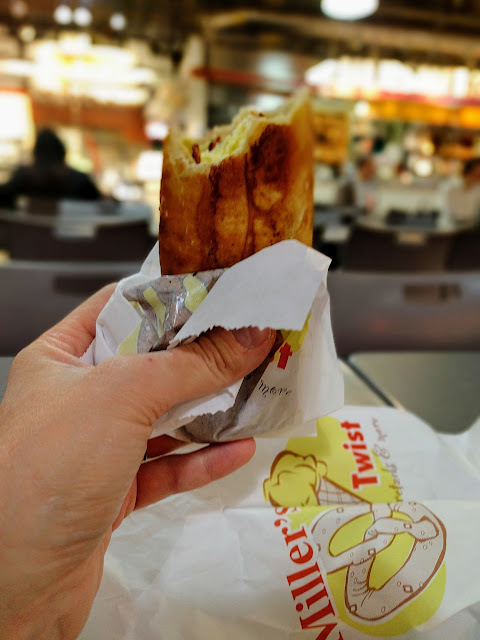 Whenever I visit Reading Terminal Market, I go at breakfast time and eat a slice of Amish Pie, an egg and bacon stuffed pretzel and a coffee from Old City Coffee. Yes, it's heavy but you can walk it off later. 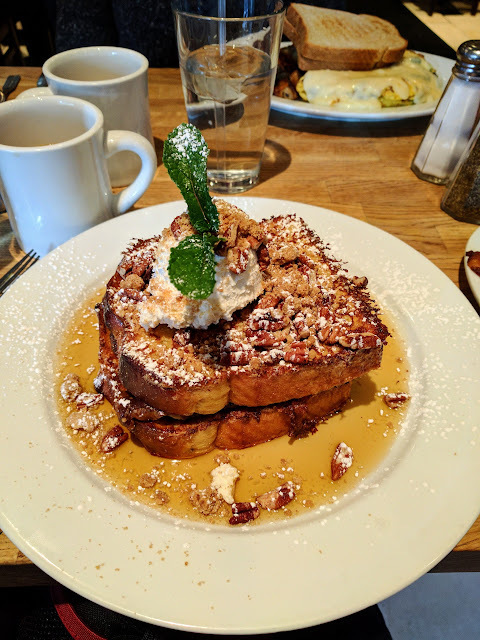 While we're on the subject of food, I discovered Green Eggs Cafe on this most recent trip to Philly when I took the opportunity to meet an old friend for Sunday brunch in Center City. Walking down memory lane isn't just about places, it's about people too! We caught up over pecan pie French toast and some of the best bacon I've ever tasted. If you're hungry, Philadelphia's Green Eggs Cafe has got you covered for a winter weekend breakfast/brunch with friends. I love how throwbacks to colonial times are interwoven into the modern city. Philadelphia's City Hall is a beautiful structure and sits at a cross-roads of several major streets in Center City so you can see it from almost anywhere. 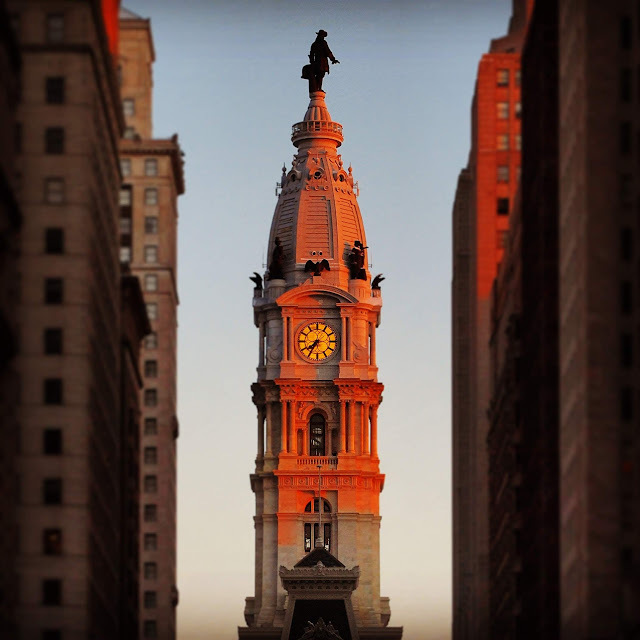 For years, no building could be taller than William Penn's Hat at the top of City Hall but sadly that rule has been relaxed a bit over the years to allow for construction of some modern skyscrapers. 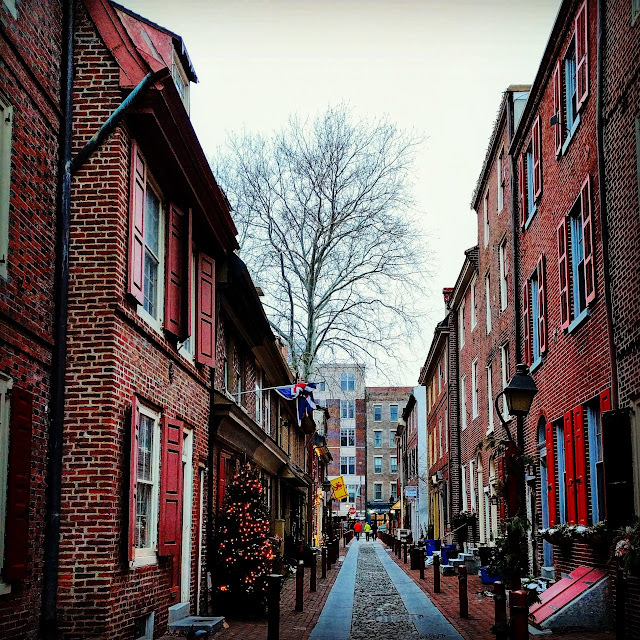 Even after 10 years away, I never grow tired of wandering around Philadelphia's Old City. 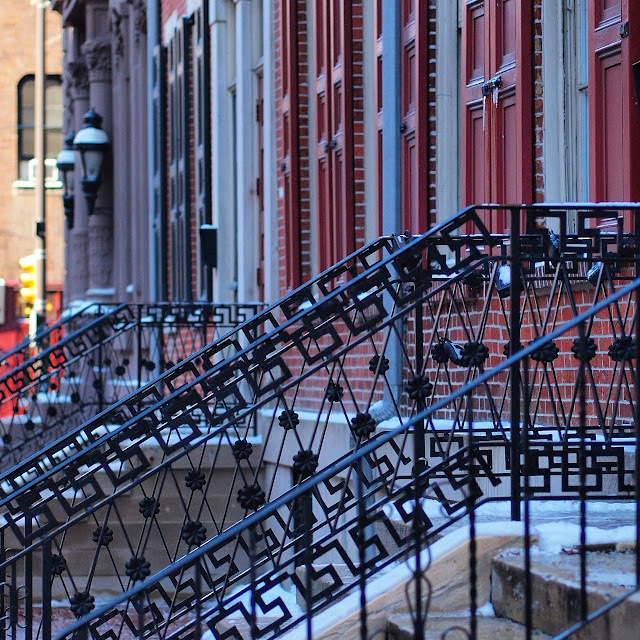 I braved the January cold to admire the facades and colorful shutters. Whenever I encountered a small cobbled street, I turned off the main road and thus took a step back in time to Colonial America. On my way back to 30th Street Station after a whirlwind 48 hours in Center City Philadelphia, I took a detour through another favorite neighborhood; Rittenhouse Square. In the approach to Rittenhouse Square, you'll see old churches backstopped by modern glass skyscrapers that gleam in the sun. Philadelphia is definitely a city of amazing contrasts. Walking through the park at Rittenhouse Square, I reflected on my visit; much had changed in the 10 years that I'd been away, much of it for the better. Philadelphia has a lot to offer. It's a shame that the city is often overlooked by tourists traveling between New York and Washington. I was proud to call Philadelphia home for nearly a decade and I always jump at the chance to go back and revisit my favorite places. What are your favorite spots in Center City Philadelphia? Leave a comment below. For some additional reading on travel in Pennsylvania, why not head over to the opposite end of the state to learn about all the fun things to do in Pittsburgh? 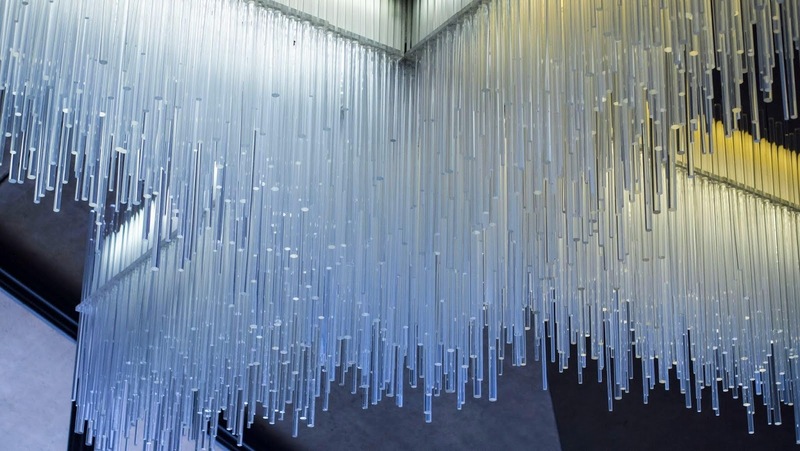 Learn about things to do in Center City Philadelphia in winter. Join a former resident on a walk down memory lane as we explore the sights of downtown Philadelphia from Old City to the Schuylkill River.